Plastic is not magnetic, is it? While there was some Panta going on today, it was revealed to me, via a highly respected and trusted source, that trying to attach a magnetic device to a piece of plastic pipe work was not going to work. Today I had the simplest of tasks to do. Make some software available for some users. I always test out the software first to see if there are any issues etc. I was given a CD with a piece of software on it, a single exe with a Username and Password to run it. That didn’t work? After several attempts, I paid a bit more attention and realised that the Username and Password details were printed in reverse. I skim read the CD and see that it said Username and Password but didn’t notice they were the wrong way around! So I swapped the Username and Password around and tried it again. Still no joy! I left it for a bit as I had other stuff do and came back to it just before lunch. I had a quick read of the manual and that told me a Username and Password combination the same as what was on the CD but the other way around! However, I had already tried it both ways! I copied the exe onto my desktop and popped the CD out of the drive and run the program again making sure that I had typed the password in correctly. This time it worked? WTAF? I then put the CD back in and tried it again only to get the same error as before? I then loaded up the manual to have another read only to find a sentence saying that you have to copy the exe onto your computer for it to work? Err I guess I must have missed that bit. Ooopps! Being an IT Pro! I never read the manual 😉 maybe I should try that from now on! How do I create a blank Excel spreadsheet? So today I got the first support call from the Silver Fox for this year, and boy what a corker! Apparently, he had been trying to create a blank Excel Spreadsheet for the past 2 days and had resorted on opening an old one, deleting all the sheets and then saving it as a blank! I asked him why he hadn’t called me after 30 seconds of not doing it? He said it was late and didn’t want to call. Fine, I said, but you could of emailed so I picked it up in the morning. Anyway, I remoted on and set about showing him how to create a blank Excel Spreadsheet. First and easiest way, Click Start > Microsoft Excel 2010 and errrr there we go! Or right click in a folder and select New > Microsoft Excel Worksheet and there you have a blank sheet. Unable to join the domain? Today I set about installing a new server to replace an old one. This was going to be a Virtual Server on our Hyper-V cluster. I have built enough servers of varying OS versions on Hyper-V enough times to not even think about what I am doing so was a tad surprised when it failed to join the domain. A quick check of everything showed nothing obvious, as sometime I do make the odd stupid mistake! The server had a DHCP IP address, I could ping IPs on the network, I was able to download files from the internet – which were about all I normally do before joining a new server onto the domain. I let the server update itself with the latest OS updates and reboot, but that made no difference. I then set about checking out the NetSetup.log and work through any issues in there. After checking that and getting nowhere and starting to lose interest I decided to move the VM to a different node and try and add it to the domain again. This time it worked! I really have no idea what that is as I have not had that issue before and have joined servers on to the domain with not issues plenty of times. Maybe if I have a lull in work I will revisit, but as I have looooaads to do I don’t think that will happen anytime soon. Today I have decided to end my crystal growing project with H and Tbone. 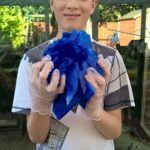 I had ordered 5KG of Copper Sulphate some 7 or so years ago and never got round to growing anything more than a very small seed crystal, mainly because the boys lost interest very quickly!! But over the summer holiday i decided to give it another try. This time i spent just over 2 weeks on it, ending up with me using all 10kg of copper sulphate and running out of containers big enough to put it in. I don’t have a laboratory in my house and it gets to a point where heating up 10 plus litres of copper sulphate solution takes far too long and becomes very complicated. 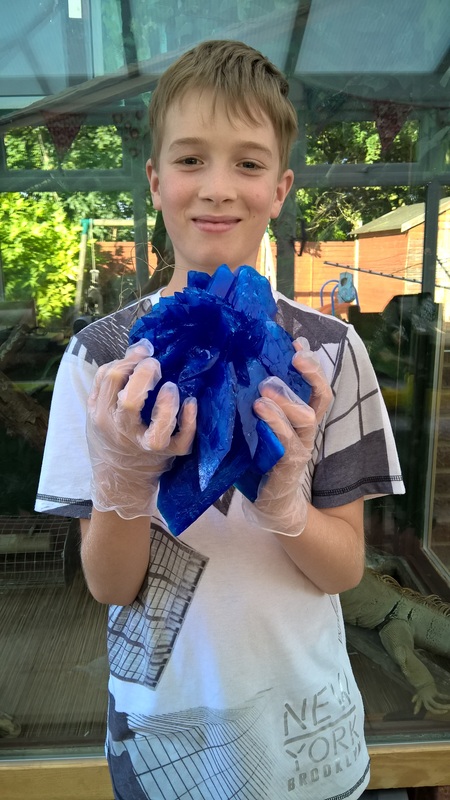 So 10KG / £60 of copper sulphate later, we have ourselves a 4KG crystal to show off – as you can see below. Its been a while since i have added any new posts to my site. Having no time and my admin interface not being 100% complete and up to date means its a massive pain in the arse to do stuff! I’ve decided to move everything over to WordPress to make life easier. I have to keep up with changes to all kinds of web stuff and i just don’t have the time to do it any more. As much as i love doing a bit of php coding, its just too much of a time consuming job. So I’m saying goodbye to a couple of features that i cannot currently port across – Quote of the day (QOTD) and reverse all visible text on a specific set of dates. I might be able to add the QOTD back at some point, i might even try and write an add on widget thingy whatssit for it. The reverse all visible text however is probably not going to be possible. It took me ages to write that function for my old website and make sure that it all worked ok. Anyway, WordPress it is from now on. Today i received a message on my website, interestingly from someone kind of detailed in one of my blog posts. 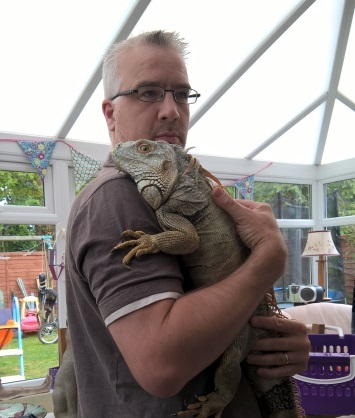 The blog post was Dodgy Recruitment which detailed my issues trying to get my details removed from a recruitment company that i never signed up with or wanted any information from. It was a ridiculous trail of just how stupid things can get and just how much some of these people do not care about peoples personal data. The message i received was polite and asked me if i could remove my blog post, as it have been over 2 years since it happened and that working practices had changed to put a stop to the issues i had experienced. Apparently my post was finding its way to the top of a search engine – number 2 on Google by the looks of it. While it was good to hear there had been changes, i want the original post to serve as a warning, after all once my email address get used and abused i stand no chance in getting it removed.